Various types of minnow can be found in Texas. Minnows are the largest of all fish families, according to the Aquatic Community website. The small, silvery fish can be found in bogs, swamps, rivers, streams, ponds and lakes. Types of minnows include goldfish, carp, chub, shiners, fallfish and dace. There are seven species of freshwater minnows in Texas, according to the Texas Parks and Wildlife Department (TPWD). Common carp is a heavy-bodied minnow with barbels on either side of the upper jaw and a yellowish-white belly, according to TPWD. It ranges in color from brassy green or yellow to golden brown or silver. Common carp are generally 12 to 25 inches in length and weigh eight to 10 pounds. Grass carp is one of the largest members of the minnow family, according to TPWD. Its oblong body is covered with large scales, while its head has no scales. Grass carp are silver to olive in color and can weigh 65 to 80 pounds in its native habitat. Texas shiners have large eyes, black lips and a clear stripe just above a black stripe along its side, according to TPWD. The species is generally found in schools, with individuals up to 2.5 inches in length. Its typical habitat includes rocky or sandy runs and pools. The golden shiner is a deep-bodied minnow with a small, upturned mouth, according to TPWD. Its back is olive with a darker stripe along the midline, while its sides vary in color from silver to gold. The species, often used as a bait fish, prefers water with little or no current. In Texas, golden shiners 8 inches long and weighing a quarter-pound have been reported, according to TPWD. 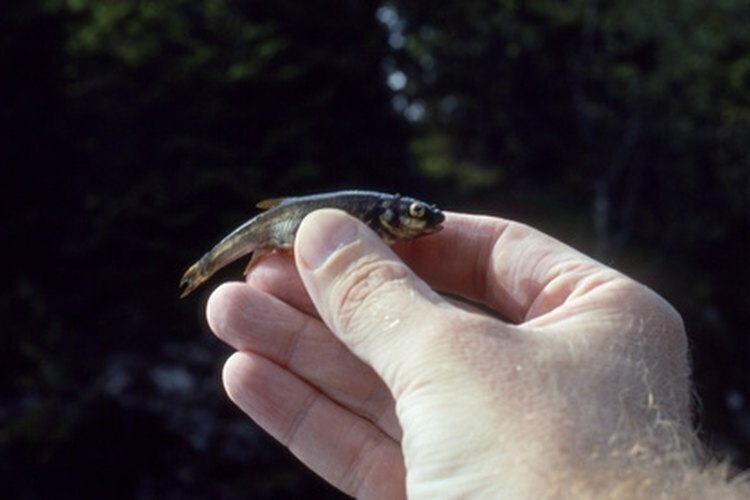 The blacktail shiner is a slender minnow with a prominent black spot at the base of the tail fin, according to TPWD. It has a yellowish-olive back and silvery sides with hints of blue. In Texas, the species can reach 4.6 inches in length, according to TPWD. Blacktail shiners are most abundant in areas with swift current, little vegetation and gravelly bottoms. The back of the red shiner is olive green with silver on the sides, according to TPWD. Red shiner, sometimes confused with the golden shiner, is a plain species. It is about 3.5 inches long and often used as a bait fish. Fathead minnows have a rounded snout, short rounded fins and a dark spot at the base of the tail fin, according to TPWD. There also is darkening along the midline of the back. The species is most abundant in small streams and often raised in ponds for sale as a bait fish.